HBO Boxing Insiders Eric Raskin and Kieran Mulvaney discuss Miguel Cotto's dominant win over Sergio Martinez for the middleweight title and – along with Harold Lederman – the upcoming fight between Ruslan Provodnikov and Chris Algieri on Boxing After Dark, June 14 at 10 PM ET/PT. It would be easy to say that Miguel Cotto turned back the clock in a virtuoso performance against Sergio Martinez on Saturday night. It would be easy, but it would be wrong. Cotto, 33 years old and with 42 professional bouts and many ring miles under his belt, didn't look like the contender who 14 years ago began his body-punching assault on the 140-pound division. He was far superior to that young man, combining offense and defense more effectively and beautifully than at any stage of his long and glorious career; and the 21,090 in attendance at Madison Square Garden, which has applauded so many of the greatest nights of that career, roared in celebration when the bell rang to begin the tenth round, Martinez stayed on his stool, and Cotto was crowned the middleweight champion of the world. By that stage it was remarkable the fight had even lasted that long. Cotto, bouncing on his toes and working behind a stiff jab and his trademark impassive mien, hurt Martinez in the opening 30 seconds of the first round with a left hook and, smelling blood, moved in instantly for the kill. A flurry put Martinez down as the crowd exploded in euphoria; seconds later, he was down again, and before the round was over the champion had been bowled over a third time. The excitement of the moment was matched only by the astonishing improbability of events: Martinez was supposed to be the stronger, faster, harder-hitting man, and yet Cotto was physically dominating him from the outset. The Puerto Rican's hands were faster, his punches were harder, and despite being the smaller, lighter man, he dominated in the clinches, pushing Martinez around like a rag doll. Martinez survived the first round, and the second, and the third, but even as he began to clear his head, began to get his feet back under him, began to fight back and land southpaw right hooks and left hands, there was nothing to suggest he had the ability or the strategy to turn back the tide. Cotto, constantly on his toes, showed perfect balance as he kept coming forward, putting Martinez under pressure. He switched his jab from head to body, keeping Martinez guessing and on the back foot, all the while looking to land that vaunted left hook – following it on occasion with an equally effective right hand. Even when Martinez was able to launch an assault, Cotto's defense kept him out of trouble. In the ninth, Cotto slipped away from a lunging Martinez right hand and landed a short counter that caused Martinez to stumble and touch his glove to the canvas for a fourth knockdown. By then, Martinez, troubled by Cotto's punches and by his own balky right knee, was all but done, prompting his trainer Pablo Sarmiento to ignore his charge's entreaties for "just one more round," and to call for a halt to the contest. Cotto landed a remarkable 54 percent of his punches, more than twice as many as Martinez, and almost every one of them detonated with greater authority than any of those thrown by the deposed champion. "This is the biggest achievement of my professional career," said Cotto afterward, who thanked trainer Freddie Roach for "the most beautiful camp of my career." Roach returned the love in spades. "I think we passed the audition," he smiled, channeling John Lennon. "I'm so proud of Miguel. He worked very hard in camp. He deserved his historic victory. He was picture perfect. We won every round. He didn't get hit with nothing. His defense was beautiful. I kept telling him the same thing after every round: 'That round was better than the last one.'" Of Martinez, Roach offered that, "He's got a lot of balls," for peeling himself off the canvas three times in that opening round. But such compliments were of course of little consolation to the Argentine. "I got hit with the punch [in the first round] and I was cold and I never recovered after that. I tried to do my best and I want to apologize to the Argentine fans and I want to thank all of the Puerto Rican fans for coming out. You've got to know when to win and you've got to know when to lose and I give all congratulations to Miguel Cotto." On this night, more than any other in a sure-fire Hall of Fame career, such congratulations were richly deserved. It isn’t too often that the highlight of a fight is when one of the boxers accidentally lands a right hand on the chin of the referee, but the final round blow – landed unintentionally on, and taken well by, ref Steve Willis – was arguably the most memorable moment of a strange featherweight ten-rounder between MarvinSonsona of the Philippines and Puerto Rico’s Wilfredo Vazquez Jr. It all started brightly enough, with Sonsona dropping Vazquez with a body shot in the opening frame, but soon degenerated into a scrappy and histrionic affair. Sonsona was deducted a point for hitting on the break and complained frequently about accidental head butts. At one of point the two men managed to fling each other to the canvas. The crowd reacted to the verdict – a split decision win for Sonsona by scores of 96-92, 96-92 and 92-96 – with utter indifference, and turned its attention to the main event. Javier Maciel dropped Jorge Melendez in the fourth round en route to a stirring majority decision win over ten rounds in an exciting 154-pound title eliminator. Argentina’s Maciel swept the first four rounds on two of the three judges’ scorecards; hetook the fourth by three clear points as a result of the knockdown and Melendez being docked a point for low blows. That left the Puerto Rican with a mountain to climb, and although he rallied over the second half of the ten-rounder, including a rousing final round that saw both men swinging for the fences, it was too little, too late. Maciel took the fight on three weeks’ notice after Melendez’s scheduled opponent Yuri Foreman, unhappy with his managerial situation, announced his retirement. Wobbled, hurt and seemingly on his way to stoppage defeat, former middleweight title challenger Andy Lee uncorked a righthand that knocked John Jackson out cold, dropping his opponent face first to the canvas and giving the Irishman a dramatic victory in the opening bout of the pay-per-view. Up until that point, it had not looked like Lee’s night: he was dropped in the first round by a right hand, and, in his first outing at junior middleweight, didn’t look especially convincing at any other stage of the contest. For most of the four completed rounds, Lee tried to keep Jackson at distance, and Jackson looked for a chance to unleash a combination. 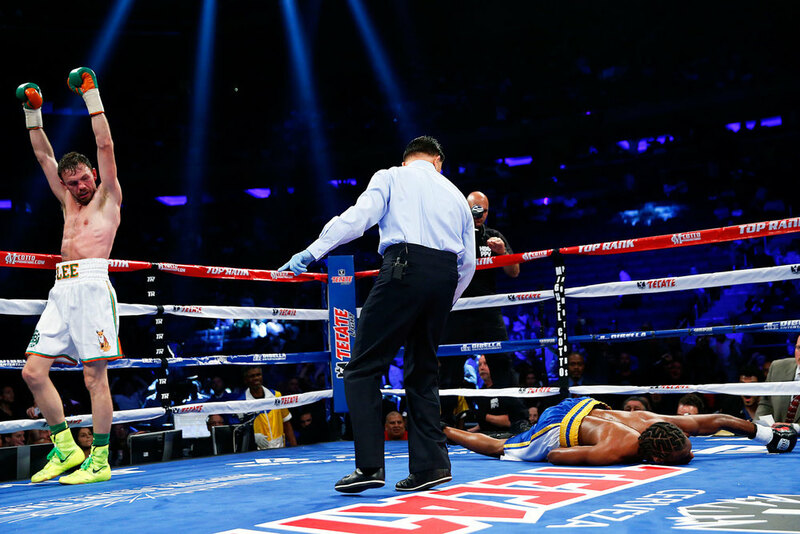 In the fifth round, one such combination shook Lee, who covered up against the ropes, stumbled uncertainly over to another part of the ring, but then suddenly unleashed the punch that ended Jackson’s night and may have been the knockout of the year. Check out this collection of photos leading up to tonight's main event, when Miguel Cotto faces off against Sergio Martinez on HBO PPV. Follow the action live on Twitter. 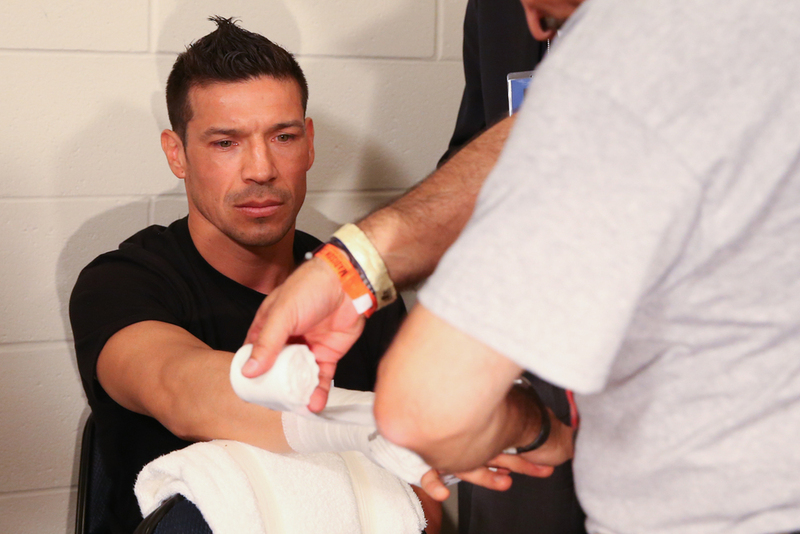 Sergio Martinez has not, it is fair to say, been shy about expressing irritation during the build-up to Saturday’s clash with Miguel Cotto. Irritation at entering the ring second, at being introduced first, at being listed second in the promotion. After all, he’s the middleweight champion, dammit, while Cotto has never been universally recognized as the man in any of the weight divisions in which he has picked up title belts. To which litany of complaints Cotto has shrugged and simply pointed out that, from a business standpoint, he is the A-side and Martinez is not. The fans that will be flocking to Madison Square Garden will be doing so mostly to see him. Certainly, that was the case at Friday’s weigh-in at the MSG Theater; the line of fans snaked from the front entrance on 7th Avenue, along 33rd Street and most of the way to 8th, and although there was no shortage of blue-and-white Argentina soccer shirts on display, it was Puerto Rico that was represented in full force. 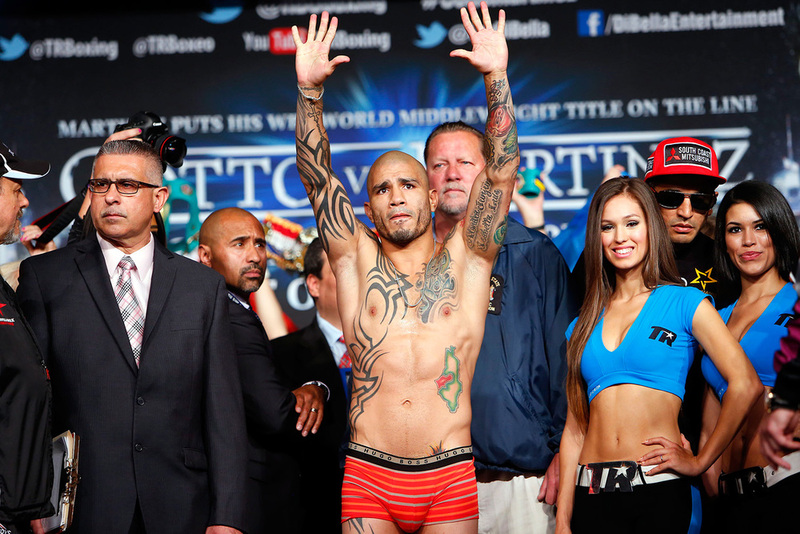 No fighter in recent times has owned the Garden the way Cotto has; Saturday will be his ninth appearance at the storied venue, his fifth on the eve of Puerto Rican Day, and has the potential to be the greatest of them all. Martinez, of course, chafes at the notion that the storyline is all about Cotto. He dearly wants to seize back the narrative with both fists, by pounding Cotto into submission or unconsciousness in front of those same adoring fans. After gesturing at the booing Cotto supporters, after teasing them by making as if to take off his shirt for the weigh-in only to reveal another shirt beneath, after whipping them into a froth as he and his rival engaged in one of the lengthier face-offs in recent memory – they might still be staring darkly at each other even now had their handlers not separated them – he turned to the crowd and pressed as many verbal buttons as he could think of. Cotto weighed in at a trim and muscular 155 pounds, four inside the contracted 159-pound weight; Martinez ducked under that limit at 158.8. Speculation will continue about whether Cotto can handle the larger man but mostly about whether Martinez is gimpy and struggling for conditioning – all the way until the opening bell. At which point, the poster placement, the ring entrance order, and the rumors will all be rendered instantly irrelevant. It will all come down finally to two men, who genuinely seem not to like each other very much, swapping punches until history is made or the normal order is restored. Watch 24/7 Cotto/Martinez show #2. It all leads up to their live pay-per-view fight Saturday, June 7th.